Total Hockey Minnesota (THMN), located in downtown Lakeville, offers the most advanced hockey skills training program available. Using unmatched technology and skills training programs, Total Hockey Minnesota places its training focus on the most crucial skills necessary to the game of hockey: quick hands, quick feet, hockey vision and multi-tasking. 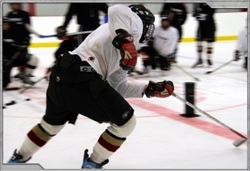 Offering on and off-ice training programs, no other hockey training program offers the depth and breadth for specific skills development.